Rugged and connected solutions are providing front-line officers with cutting-edge technology to address the challenges of 21st century policing. From the streets of Vancouver, all the way to the harbor front in Halifax, those who serve the public have been getting the job done with reliable Panasonic Public Safety products for over 20 years. We provide law enforcement and security industries with modernized solutions that protect the front-line officers, businesses, and the public at-large. The Toughbook, Arbitrator 360°® In-Car Video, and newly released Arbitrator Body-Worn Camera are rugged in design to keep the officer always mobile and safe allowing to capture of mission critical video 24/7. As the police community knows the quantity and variety of digital evidence is growing exponentially. Forward thinking police departments are seeking new ways to set their police departments up for the future expansion of digital and video evidence. Panasonic BLUE manages all assets with an overarching vision of reducing police officer administration time by 50%. As the needs of public safety continue to evolve, technology should too, which is why Panasonic continually challenges assumptions addressing the needs of public safety, like capturing the vast amount of digital evidence and the ability to manage it all in one single system. Panasonic BLUE enables police services to track and manage the growing amount of digital assets and evidence in one place, solving one of the most critical problems in the industry: front-line officer time. Every minute of time spent on burdensome administrative work is a wasted opportunity to use police services to its fullest. Panasonic BLUE relieves that burden and allows police to spend more time protecting the community by spending less time with notes and digital evidence. With over 20 years of experience in Canadian public safety, Panasonic continues to invest in products that will support the needs that law enforcement and security industries face today and into the future with a strong focus on video solutions and digital evidence management. Panasonic enables police to harness technology to increase productivity as they handle their daily duties. The Panasonic BLUE mobile app easily captures photo and video evidence, obtains witness statements, and features notes with tags that go directly to the RMS. With BLUE, front-line officers can collect richer digital evidence, receive public evidence through a secure link and spend more time connecting with the community. Police officers are constantly on-the-go serving their community. Whether in the patrol car or pursuing someone on foot, Panasonic has you covered with the Arbitrator 360 degree In-Car Video and Arbitrator Body-Worn Camera. 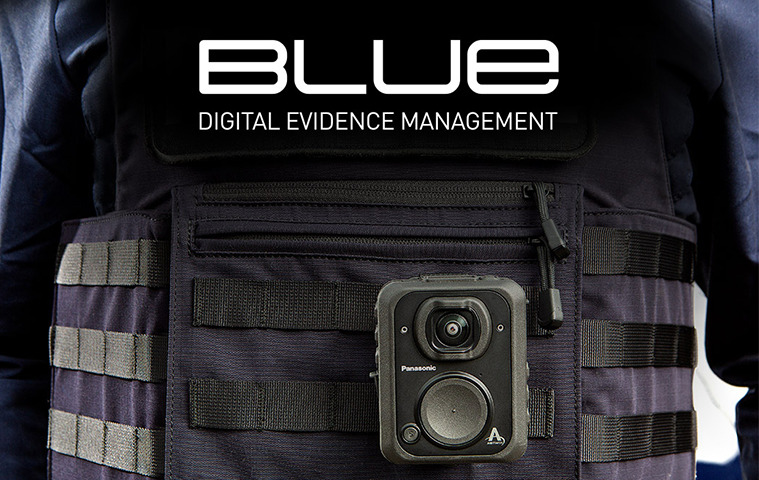 Informed by the same purpose-built philosophy as Panasonic’s market-defining rugged mobile and in-car video technology, Panasonic BLUE enables police services to track and manage the growing amount of digital assets and evidence in one place. Step into the future with Panasonic BLUE prosecutor file sharing. After organizing digital files for a case and redacting any necessary sections, Panasonic BLUE offers a simple interface to share files with prosecution, media, or other parties, while maintaining tight control on access with a full audit trail. Panasonic BLUE provides police services with an all-in-one evidence management system to effortlessly track and manage all digital evidence files. With an open API framework, existing digital assets and future ones can be easily accessed through one interface. Panasonic BLUE’s unique architecture embraces efficiency by automatically storing evidence on premise or in the cloud based on the metadata. With a built-in reporting functionality, users have the flexibility to create either custom or template reports. A Full Public Safety Solution Delivered by a Seasoned Technology Provider.